I love my ukulele. Ive only had it 4 years, and I’m not very good. 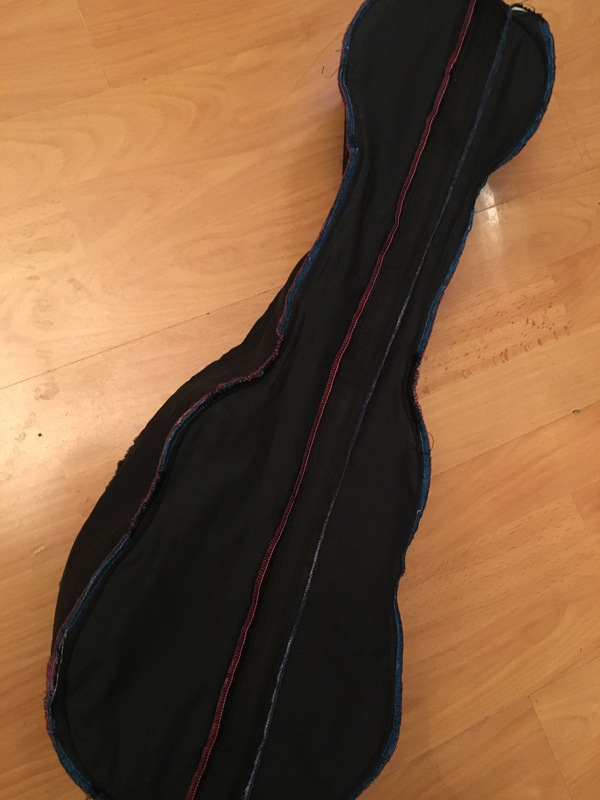 I’ve learnt about ten chords, so if your requested song is covered by the 10 chords I know, then I’ll give it a bash (you wouldn’t recognise it, but that wouldn’t stop me!). Occasionally, I get to play with CousinA who is a very accomplished musician… he plays all the fiddly bits while I strum out my c-f-g feeling like the Boss. They’re always my favourite sessions. Sadly, my uke has got a bit dusty since I’ve owned a sewing machine. But that doesn’t mean I love it any less. We once went on holiday with a big group of friends. 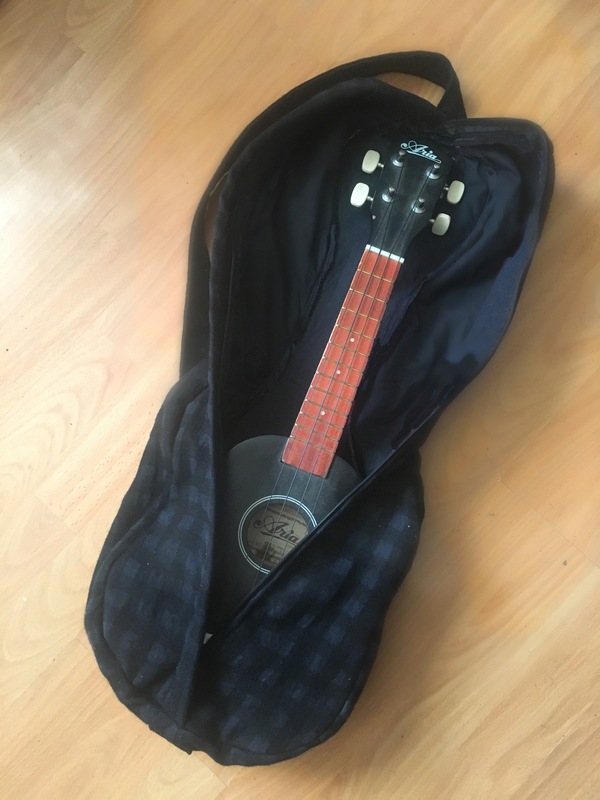 I didn’t take my ukulele with me, and every day, sometimes twice a day, someone would say ‘oh, I wish you had brought your ukulele…’. One bedtime, I said to MrA, ‘it’s been asked for so much, I wish I’d brought it with me.’ To which he replied, ‘It’s only been asked for so much because you didn’t bring it with you!’… I have to admit, he’s kind of got a point there. 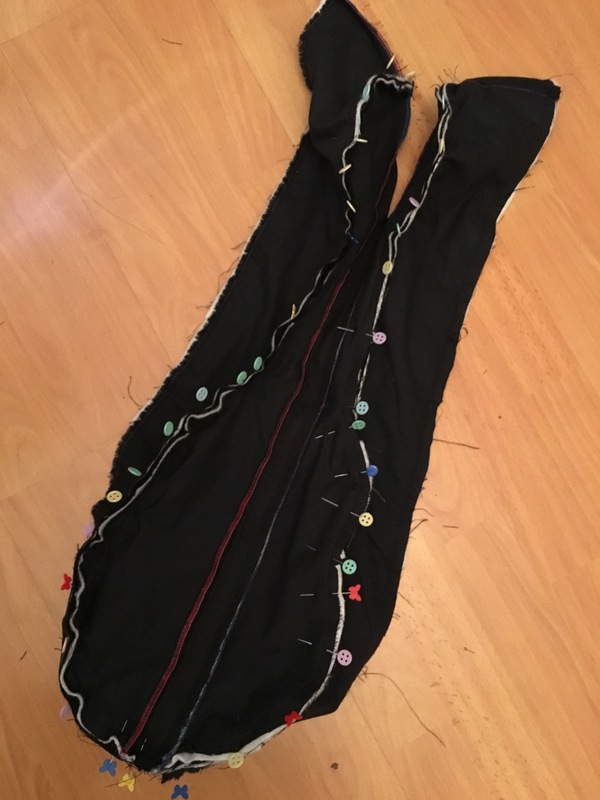 I started by tracing around my uke, then added 2.5 cm all around (1.5cm for seam allowance & 1cm ‘ease’) this was my ‘block’ for the back pattern piece. 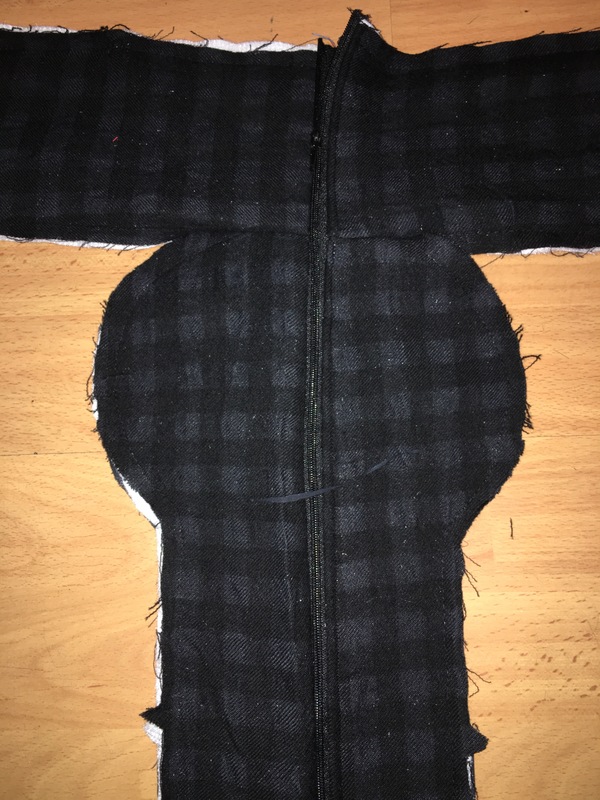 Next I traced the bottom section for an outside pocket. Then I cut out the main piece & folded it in half. 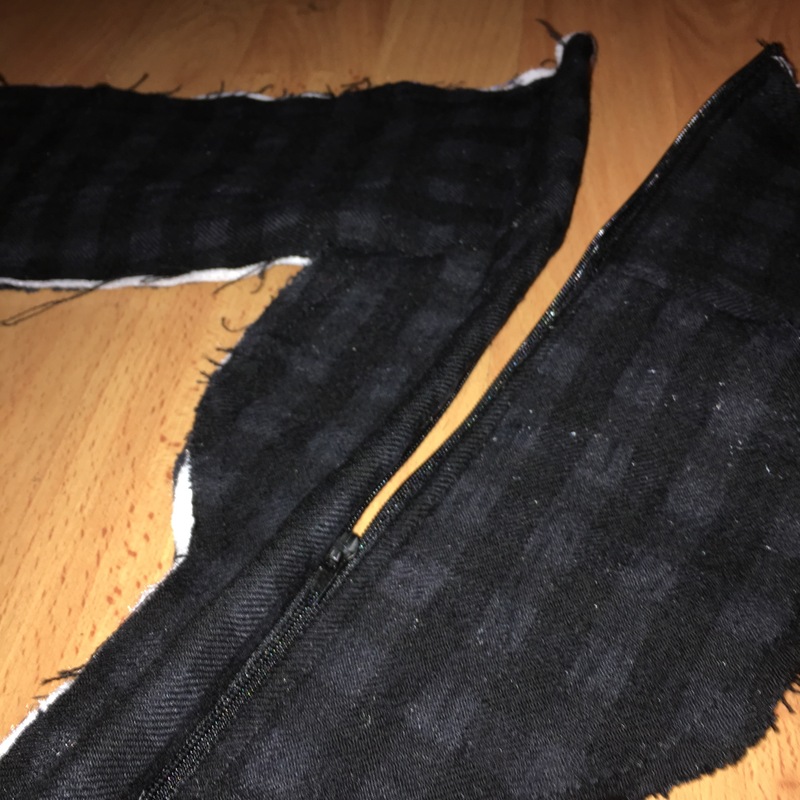 I traced it out again to make the zippered front, adding 1.5cm seam to one side and 3cm to the other side to hide the zip. Finally I measured around the seam allowance of the back pattern piece to get the side measurement length. I added the same 1.5cm to one side and 3cm on the other to match the front zip-flap. Then I cut out one each in wool fabric, wadding & cotton lining (pic above). 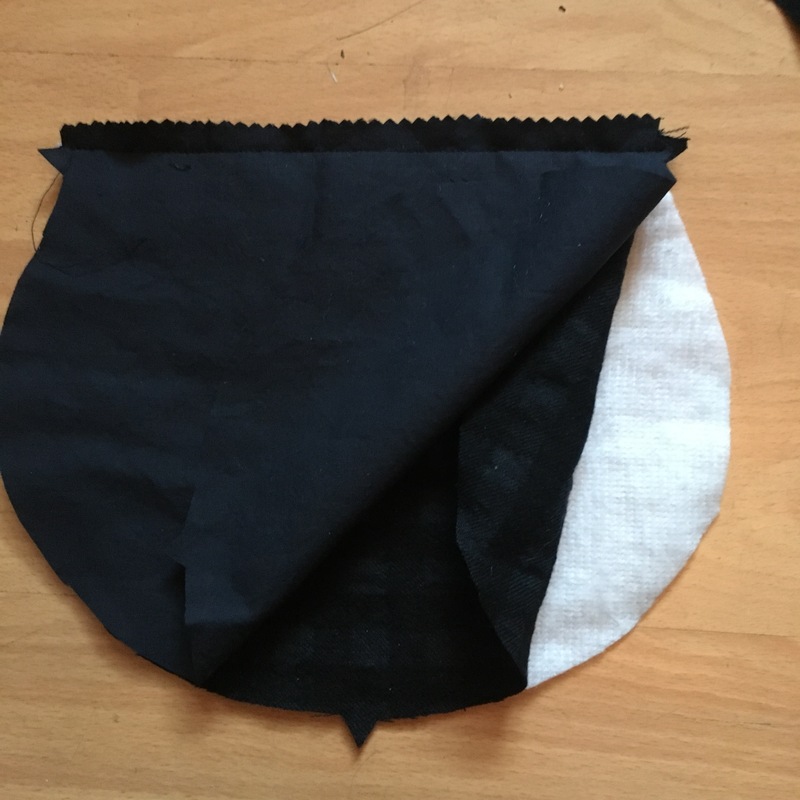 Keeping everything in the right order (wadding, main fabric, lining fabric), I sewed the top seam of the outer pocket, turned it over & topstitched the edge. Then I basted every piece together using the walking foot and basted the pocket in place to the back piece. (Basting all the layers now meant the fabric was more stable so that later on, I could use other feet; zip/ edge stitching etc). To get the zip in, first I attached the side-panels to the top-edge of the front-sections, just a little way, as I wanted the zip to reach over the top of the bag. ( I was extra careful to match the the right pieces as one is 1.5cm longer than the other). Then I overlocked the zip edge on both sides. On the shorter side I folded & pressed 1.5cm back & attached the zip underneath with just the teeth poking out. 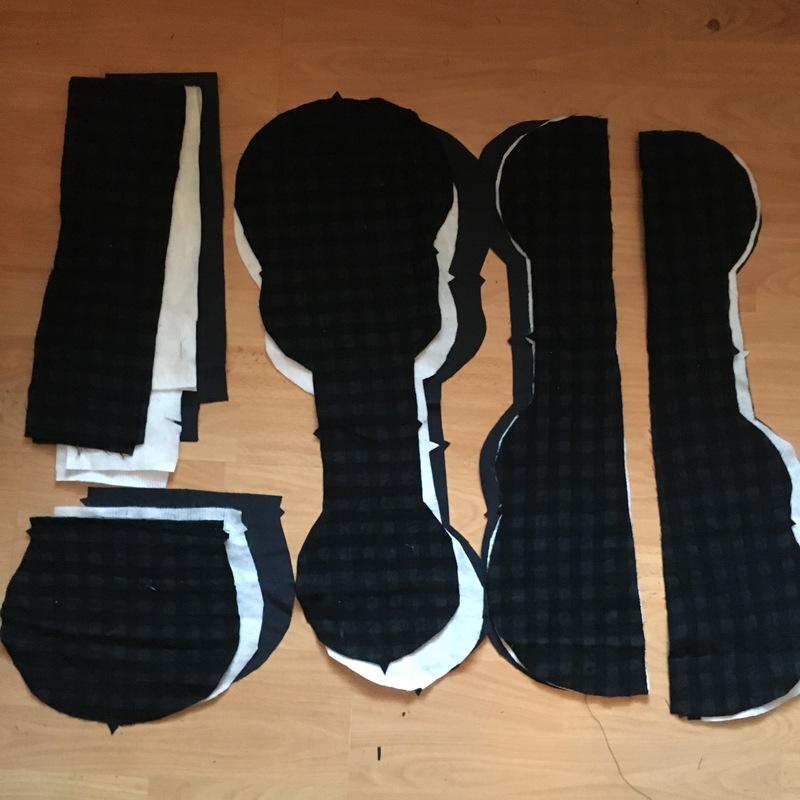 Then I laid the whole thing on top of the back piece, and folded the zip-covering-pleat (right over left in the pics), making sure it ended up the same size at the bottom piece. I pinned the flap in place & stitched it down from the front, catching the zip tape on the other side. Bad pictures! Can you see the flap? It’s there… promise. Did I say I’d made notches? Well, I matched up the notches and pinned & sewed the back on too. For a neater finish I ran the seams through the overlocker. Here’s a pic of the insides. It looks a bit like a shapeless lump here to be honest. 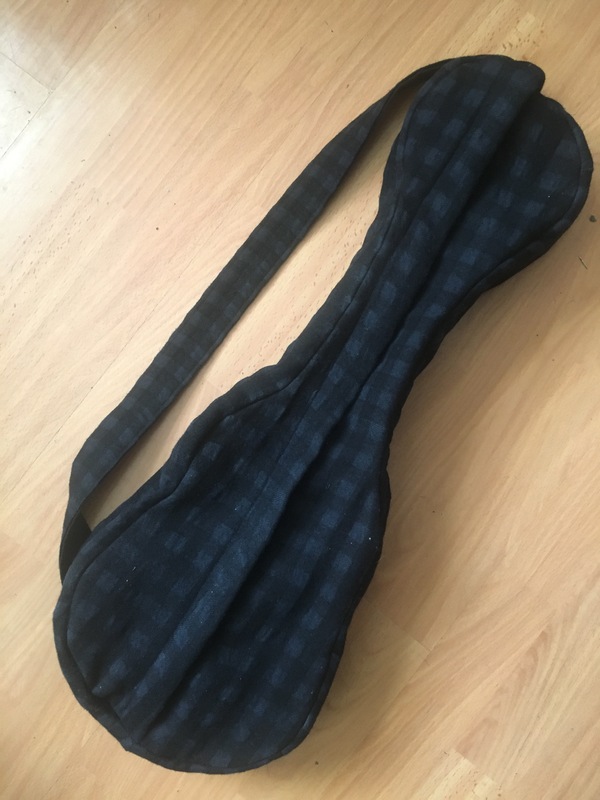 I made the strap by cutting a long strip of the wool fabric 4x the width I wanted it to end up. 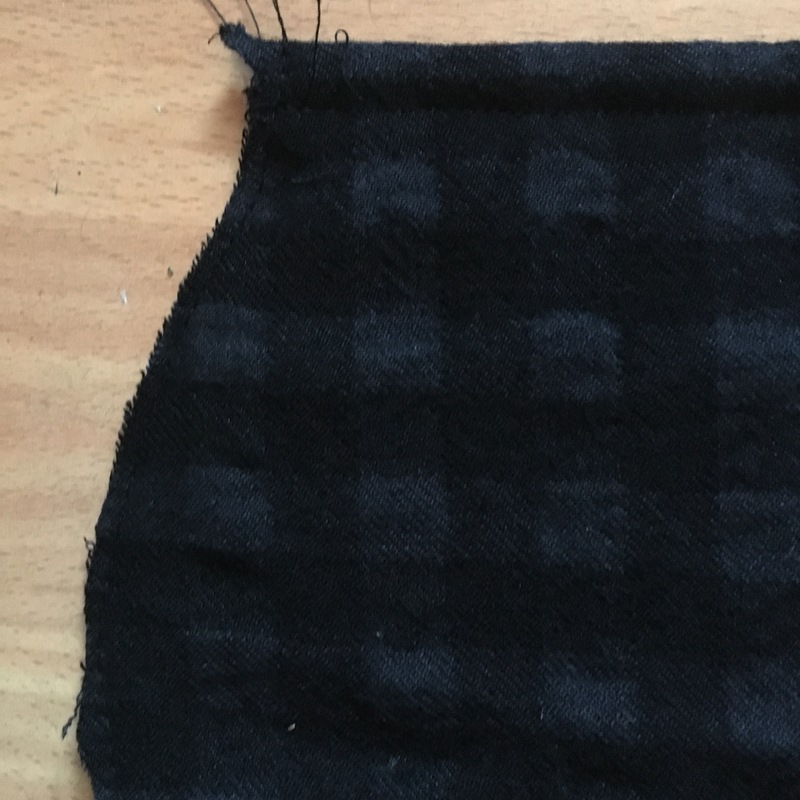 Did that fold-in-half-then-fold-the-halfs-in-half thing, and topstitched down both long edges. I still thought it looked a bit shapeless. I was contemplating methods of ‘taking-in’ a bag when MrA came home & said he loved it. So that’s it then, finished! I’m looking forward to handing it over to CousinA so that he can finally gift it to its unsuspecting recipient. Once it’s finished, dont be too hard on myself. Don’t look at it for half an hour, then decide if you hate it or not! Learn to fit properly… bags & clothes. Always make a pattern so it can be made again more easily. Wipe the dust off my ukulele. 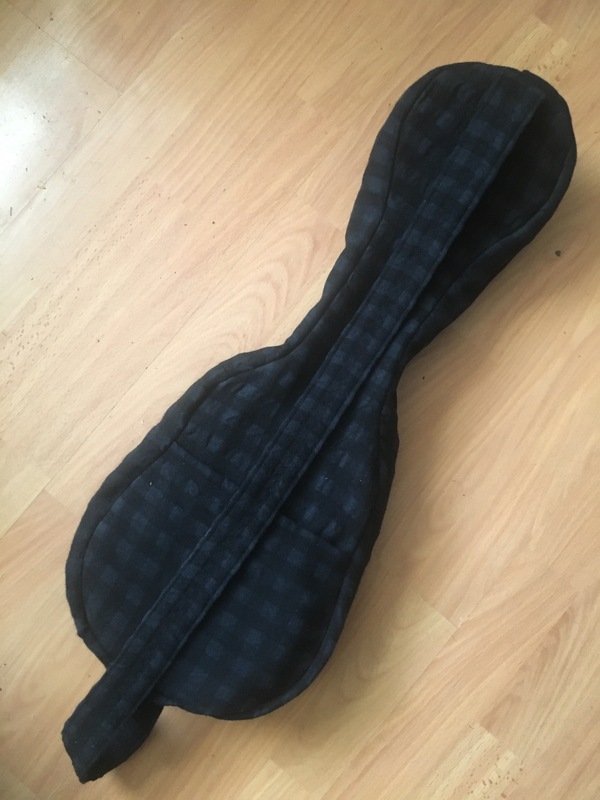 Any tips on how to get started with playing a uke? Hi, I’m probably the wrong person to ask, but I started with chords, c f & g, 4 strums of each; c,f,g,c. Then looked up the ‘dots’ for eye of the tiger & practised the chords and transitions for that. Chordie is a good website for songs, there are plenty of others too. Look for songs without too many chords or too many quick chord changes at first. It’s one of those things that takes a ‘moment’ to learn and a lifetime to master, I think! Good luck! This will go on the list of things to try. Always wanted to play an instrument, and the saxophone experiment was torpedoed by the other inhabitants of the house. Wow, a super sewing story! Wishing I could hear you playing it!